Let's take a little break from peeking inside the bags of celebrities by turning our camera on Cosmo chicks' bags instead! 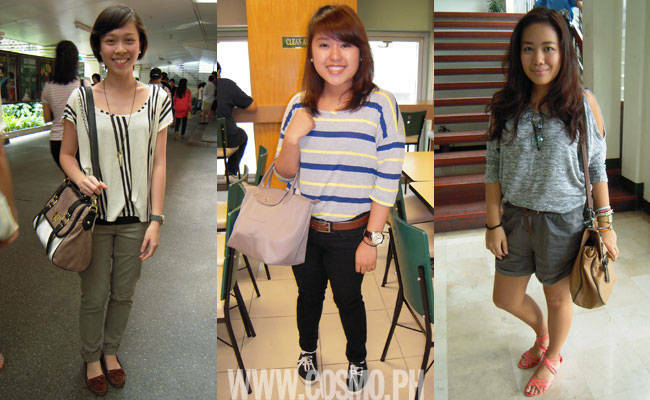 We set out to discover what regular girls like these three college students from De La Salle University bring with them to school. We first asked Darl Orillaza, a freshman taking up Early Childhood Education, to spill the contents of her trendy Longchamp tote. This 17-year-old is still adjusting to the college scene: not only does she have to get used to having male classmates, since she attended an all-girl high school, she also has to get used to the pressure, stress, and the limitless fun one can only experience in college! In DLSU, most freshmen take long walks to classes in buildings far from the main campus. That's why Darl keeps her look comfortable yet girly in a blouse-jeans-sneakers outfit. She also never leaves home without her a trusty umbrella. A self-confessed heavy packer, Darl says that she likes her Longchamp tote because "even if it's small, I can dump so much stuff inside it! Aside from an umbrella and school materials, I can even store clothes inside!" Next, we asked Candice Camara if we could check out her bag--a Tomato satchel, which is her current obsession. The fasyon college gal is always seen in her "disheveled chic" outfit--a combination of classic clothing, wavy hair, and bright, chunky accessories. Candice's handy satchel not only goes with her entire look, but it also lets her pack piles of reading material and papers for many subjects. The third year Organizational Communication major says, "Every student should have a planner so they can keep up with schoolwork deadlines. I feel crippled and start to panic without it." And since it's her last year in school (DLSU has three-year courses! ), she has gotten used to sleepless nights, which is why "a make-up kit is essential, too, to cover stress," she says. It seems like satchels are the "it bag" in DLSU these days; we spotted Stef Padilla, a Psychology major, also carrying one! Stef says her style leans toward minimalist and classic: "I like neutral colors and stripes. I usually wear boyfriend jeans, loose tops, and flats to school. Basically, anything comfortable!" We can see that her Steve Madden satchel definitely suits her taste! The bag, which she got from Hawaii, is very spacious and has a lot of secret compartments. "I like keeping my things neat and organized, so this bag definitely nailed it," says Stef. The 20-year-old college senior juggles thesis and internship during her free time, requiring her to pare down to the essentials: a Moleskine planner, I.D., folder, notebook, and pens. And like Candice, Stef tells Cosmo that makeup is one of the must-haves of every student—especially during "hell week"! Check out the stuff that these girls bring with them to school daily when you launch this gallery.